Not bad for a first time blogger 😉 I’m happy to see so many people are interested in my experience. Some of you asked me for a picture of the backup crew so I decided to give you more. I decided to share what it was like to train as backup with Peggy Whitson and Yuri Malenchenko. In the first few months of training, almost all my classes were with Dice-K and the interpreters. We took the same classes and the same tests. We performed the simulations with the instructors and only caught a glimpse of the main and backup crew as we were passing in the hallways or at social events. The last 40 days were different. Dice-K and I started to see some scheduled crew training. Dice-k would train with Michael Lopez-Alegria and Mikhail Tyurin, and I would train with Peggy Whitson and Yuri Malenchenko. I had met Peggy at a few NASA crew events in Star City and we had talked. She is a woman of strong character, super smart, and serious about space. She offered to talk with me and answer my questions any time I wanted to talk. I was very excited to get to know her and at the same time I knew she had a very tight training schedule and I did not want to be a burden. So we talked a few short times but did not connect that much. When we started to train as a crew, everything changed. We got to know each other better. I could tell that Peggy was observing me to see if I was there just for the ride or if I’m genuinely interested in space. I think she saw my genuine passion for space because she really made me feel welcome. In ISS simulations, she was the Commander and gave me some small tasks that made me feel part of the crew. She explained everything in detail and translated for me when necessary. She gave me small pointers that made me perform well on my tasks and look professional. She was wonderful and I learned so much from her. In a way, she became my mentor. I imagine that, had my life taken a different turn and I had ended up in the Astronaut corps, I could have been like Peggy. She is a serious scientist and deeply cares for the success of the space program. Throughout the rest of my training program I spent many quality hours with Peggy observing her and learning from her. She shared stories about her space flight and little things that you don’t think of but make a big difference when you are in space. She told me about the best observing stations onboard ISS, about how to move around, how to wash my hair and clean myself, how to use the toilet (everyone’s favorite subject) and how to interact with the rest of the crew members. Getting to know Yuri took longer. Yuri is a quiet and private person. He is a man of few words. He works meticulously and slowly. He does not hurry and studies and evaluates everything around him before he takes action. Watching him in the simulator, during a series of manual docking and undocking procedures, it was obvious that he knew how to drive this vehicle with his eyes closed. He was calm and composed while entering a series of very precise maneuvers to align the Soyuz manually with the docking hatch on the ISS. As I was training with Peggy and Yuri, I realized that I really wanted to fly to ISS with them. It would have made it a very special flight, with two women flying in Soyuz together and with Peggy being the first woman ISS Commander. Unfortunately the third seat on their scheduled flight was taken so I quickly started to lobby for switching place with the Malaysian candidate who was supposed to fly with them. They were both supportive of the idea and I was excitedly pushing on different people to negotiate with the Russian Space program to move me to their flight. And then… suddenly… I got the news that I was moved up to primary crew… and the rest of the story you know. I’m so proud that you are the first iranian spacewoman. hi dear Anousheh , my name is Anousheh too ! and i am from IRAN too! one years ago , i found your site in google and i am very happy that your name in ANOUSHEH! because in IRAN ,this name is very limited,now. I am so happy to have the chance to write to the first Iranian woman who is going to be in the orbit in next few days.Hope to have very great and memorable times there. As an Iranian female, I am really proud of you because of your brave heart and act. I have gotten the news about you and your journey from http://www.spacescience.ir , and I really thanks them for the very best news especially thanks to Mr.Shahram Yazdanpanah who translate some really nice essays from your site and publish very usefull information and provide us with them.Thanks a lot. Take Care and wishing you the best. 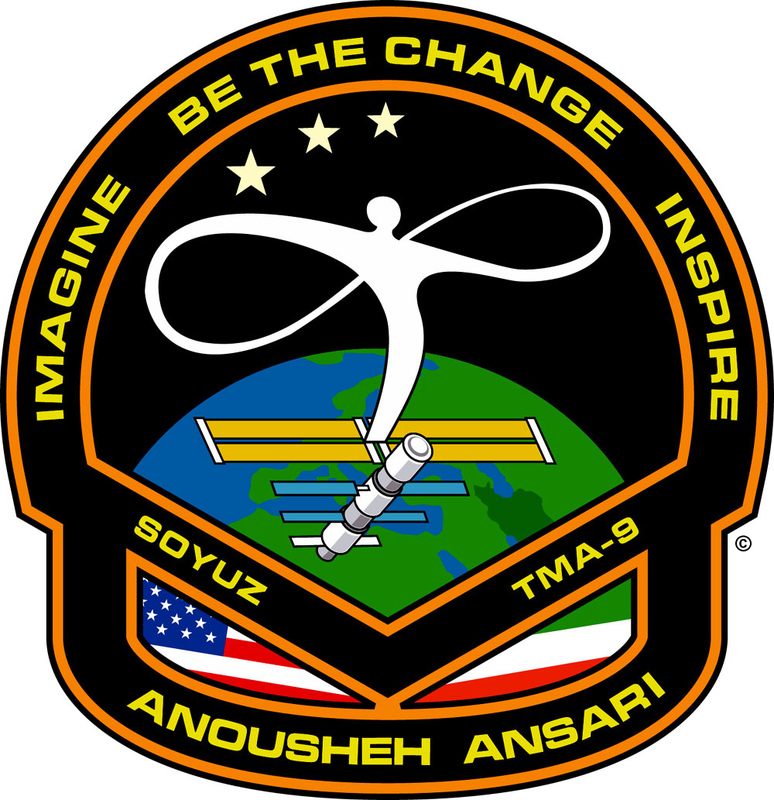 Anousheh, can you please tell me more about your personal mission patch ? how are you??? recognized me yet? This is good ol’ Hessam! Hessam Ghandchi…I was a kid when I saw you…I was 7 years old! Well, I don’t even know if you read these comments or not, but if you do, just wanted to wish you luck and say hi from the whole family…Mom is here and she is sending you her best regards. My mail is [removed but received] contact us if you have free time. Thanks so much for posting the original back-up crew photo I’d asked about. Please keep the photos coming. I enjoyed your account of working with Peggy and Yuri – a fascinating insight into how your training and relationships with your colleagues developed. I guess in some ways it must have been quite tough to break up that team when you joined up with the two Michaels. Would love to read now about how working with them has been for you. I do hope you’ll be able to keep such interesting and personal instalments coming between now and Sunday. I wish you all the best in this adventure of you. You are admirable. Great Job. We, THE IRANIANS, are proud of you. wishing the best for you, and peace for all the world. I hope you have a great trip to space. I’ve been hearing alot about you. 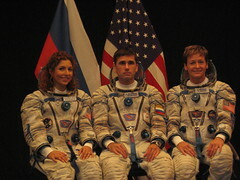 It is very amazing to be the very first female astronot to go to space. Have a great time. When you reach there to watch Earth; try to focus on what you see, try to understand what you are seeing. I don’t know how to explain this; maybe this is the time when you achieve a special feeling, a belief or a word…..
thank you very much for sharing your fantastic experience with us. And yes, the images are very nice too..
I’m following your activities for a little while and just discovered your Blog. It reminds me to my first visit to StarCity in 1995. I was too early for private flights, so I only did a virtual training 😉 Good to see some of the good friends are still there.. I know you had some training with the Ham Radio station and I hope you have a chance to talk to some Schools, I’m sure you will inspire the kids.. I have another dream and that’s about building and launching satellites into earth orbit for science and education. Already done several times, including be mission director for the launch with Ariane 5 from Kourou, which was a great experience for me to. The next dream is to launch a satellite to Mars, as a first private mission.. it can be done! If you are interested, feel free to ask more about Mars..
in highly event your space travel i like to congratulate. you are our persian pride . send our regards to iran from there. الان ۳۰ دقیقه از نیمه شب گذشته ‌، داشتم از کانال چهار تو برنامه آسمان شب مصاحبه با انوشه انصاری رو میدیدم البته تلفنی از پایگاه فضایی تو قزاقستان . قبلا راجع بهش خونده بودم و راجع به مسابقه ایکس پرایز – بحالش قبطه خوردم که عجب تجربه ای میکنه ولی …… وقتی هزینه سفرش رو تو یکی از سایتها دیدم (۲۰ میلیون دلار) !!! فکر میکنید با این هزینه بجای بردن یه نفر به جو ، میشه چند هزار تا کوچولوی گشنه رو از سفر به یکی دو متر پایین تر از اینجایی که ما هستیم نجات داد. خدایا اگر من جای انوشه انصاری بودم چیکار میکردم؟! I saw your interview with iranian tv4 this night. I am very happy that a strong women from iran is going to space. I wish you the best. nice to see your success in your hopes and goals.we (our familly) a few minutes ago watched your interview with Iranian chanel 4 here in Kermanshah Iran .wondefull your speech!. I’m a physics student in Spain and I just found your blog today… it’s so kind of you to share your impressions and feelings with us! With the best wishes for your trip, a safe trip. Greetings Anousheh and best wishes for your trip to space. I’m about your age and a resident of Texas U.S.A., like you! — So, it’s great to see a Texan be the first woman space tourist. The Eyes of Texas will be lookin’ up at you! I watched your interview on TV and it was really terrific,exiting and hopeful for me as a young Iranian boy. I was excited when I saw Iranian flag on your right arm,and the American flag on the left,it could be the sign of peace and friendship for Iranians. se you soon,in Iran,I hope! congratulation for your success as first space tourist for space. It is private matter who and how spend his or her time and life BUT Do we if we know many peopl suffer from diseases, many doesen’t have any thing to eat, many try end their life because they cant’t afford to buy something for their family. Any way we don’t live in a fair world, why should we care about others? we live as like as we want and enjoy!but many can’t. may be here is not place to say this ,sorry for unreleveant comments.for me the best thing to do is to do do some thing to relife some one form pain. I am so delighted to see an Iranian female is going to do a great job, something that never happens to be even a dream for us! Definitely by doing that you are promoting Iranian image whole over the world. What I am really interested to know is your feelings and emotions when you are in space, please share with us your experience once you are back Inshaallah. Migan har ki mikhad doa koneh roosho be asemoon mikonan chon khoda oonjast, agar oonja rafti az khoda bekhah ke Irane ma hamisheh sar faraz basheh va hameh ba eshgho safa dar kenare ham zendegi konan shayad sedaye to barash giratar basheh. Be omide bazgashte salem va ghoroor amizat cheshm be aseman montazer khahim neshast Anoushehye aziz. What a tremendous life !!! You are right…nothing can be better than living our dreams !!! I hope you will get in your eyes and memory as much as you were dreaming younger !!! First congrad’s…reading more about you is inspiring a generation. Its great to see you have the “flag” of Iran on your other shoulder (in some photos), just curious why you don’t have it on you space suit photos? You give a new meaning to the word “ambassador”, keep up the amazing work. Have a safe and enjoyable experience Anousheh and may God go with you! Thank you so much for sharing your experience, you certainly have come a long way in a short period of time! Best luck to you! I heard a lot, your name and this is the first time that I read your logs. In fact, I proud of you and I wish the best for you in your travel and hope you can be a good sample for all of us Iranian out doors who can show our streanght as a human being, and as an Irani. Anyway, I’ve tried to write some things about you in my weblog and link to your site and your weblog. I also put some of your pictures over there. Hopefully, you will give me this permition for using of those picture and if you disagree please let me know. I wish the successful flight for you and the best for your family. خانم انصاری ارزو میکنم درخت خود را با دست خود بکارید. As an Iranian woman I’m really really proud of you. You are a role model not only for Iranian women but also for every woman in the world. I wish you an enjoyable trip to your dreams and a safe return to earth. Oh my god…isn’t that exciting? you’re gonna fly to heaven, I can hear my heartbeat thinking about that! Recently the first Brazilian man went to Space and that generated a great visibility at Brazil. So I understand how proud the folks from your country are about you. Just wondering if your ticket is economic or first class ! I don’t know if how I’m relating this story makes any sense, only that it took ONE PERSON to see, for everyone to acknowledge. In short, we don’t recognize what we don’t know. So when I see someone, a human being just like any other, walking along that seemingly impossible path, it suddenly makes it plausible to me. Why not space? It begins with that first step. Anousheh, you’re taking that first step for yourself, while leaving behind a path for us to someday follow. I’m exhilarated with the possibilities that will be discovered, and the new world that your dreams have opened for us. ma be to eftekhar mikonim.vali irani bodanet ro farampsh nakon.doaye ma badragheye rahet. Wish you a successful trip. Because of you, I feel proud of being an Iranian. Khanume Ansari vaghti dashtam be mosahebatun ba shabakeye 4 e Iran gush mikardam vaghean geryam gereft. Kheyli khoshhalam v baratun az samime ghalb arezuye movafaghiyat mikonam. آرزوِِيي که ار کودکی با آن زندگی کرده ام. I praise you not because you are Iranian, but because of your courage to do a trip to the space and not as a professional astronaut, as an ordinary person who wishes to see the Earth from beyond the atmosphere. This was my childhood dream. سلام هموطن گرامی.. از اینکه میبینم یک ایرانی مایه مباهات و سرافرازی ام شده مغرورم و به خودم میبالم…خوشحالم از اینکه ایرانی ها در همه جای دنیا از اصالت تاریخی و فرهنگی و نژادی خودشون به هر طریق ممکن بهره میبرند و نام ایران رو همیشه سریبلند میکنند…. هر جای این گیتی پهناور که هستی برای تو ارزوی شادمانی و سلامتی و کامیابی دارم…. As an Iranian person who lives in FASA (a small southern town of Iran), Generally It’s my proud that I’m an Iranian, Specially when I found you are an Iranian like me ,too! It’s clear that you are going to have a most historic, wonderful trip that people have ever imagined, and obviously as you mentioned last night in Iran channel 4, you have a lot of plans to fulfill during these days. I don’t want to talk about them, because I know you are brave enough to handle them and push away obstacles successfully, But I just say two things. First, I hope GOD’S HAND ACCOMPANY YOU (an Iranian proverb which means: I hope God support you). Secondly and more importantly, I invite you (I beg you) to visit again Iran after your trip. I wish I see you in front of one of Iran channel TV chairs and hear about your experiences, sharing them to youth and young scientists. Promise me that you will do it. Daste khoda be hamrat. Omidvaram be salamati beri va bargardi, hamegiye ma montazere oomadanet be Iran hastim. Dishab goftoguie shoma ro az tv4 didam . az inke mibinam paie iraniha ham be faza baz mishe va shoma avalin iranie faza navard hastid khoshhalam va ehsase ghorur mikonam ..
hamishe baiad ensanhaii mesle shoma pishgame harkathaie bozor bashand ta pishraft surat begire . We; all the Iranians, are proud of you. And we all wish you a delightful and safe travel. It would be really great if you keep in touch during your travel. Wherever you live, you are one of us. With all these embarrassing constant news about Iran every day, now I am so happy that I can be proud of being an Iranian once again. I am from India. I also want to be an astronaut. Have fun up there and enjoy every single moment. Best of luck for your trip to the heavens. خانم انصاري موفقيت سركار را كه بهعث قليان غرور هر ايراني گرديد تبريك گفته برايتان از صميم قلب سربلندي و سرافرازي روزافزون آرزومندم. I hope you have good journey to space! Please take many pictures from space and publish in your blog. Take my dream together with yours to the space and bring the other half of the story to the reality. P.S. You can’t imagine how deep and great feeling I have when I see our red-white-green’s flag on ur arm, meaningfully with some of the symbols and without some others. dishab mosahebato az tv4 iran shenidam…yani kole khoonevadam shenidan….kheyli baramoon moheme..ke ye 2khtar irooni dare mire faza…khodaeesh man az tarafe khoonevadam va hame irooniha behet tabrik migam.. .
bayad bedooni ke to iran hale agal 40 melyoon nafar toro mishnasan….30 melyoon sedatoo mistagim az tv4 iran shenidan…hamamoon khoshhal shodim ke sedaye in khanoom irooni ro shenidim….rasti jalebe bedooni madar bozorgam ke 80 shg sen dare ham dishab bade barnamat ba tv4 neshast va dasht bara safaret doa mikard…. khob..mozahem nemisham..va omidvaram ye rooz vagt koni va payame manoo bekhooni..
i so happy that see a iranian woman can go to the space! happy to you and happy to iran.have a good time in the space. anoosheh joon..shayad az sadegi payamam va ya in hame rahati to neveshtane payamam ja bekhoori..vali man nemidoonam chera vali hes mikonam ye irooni mitoone ba irooni kheyli samimi bashe..
fargi ham nemikone in irooni koja bashe …chand salesh bashe va …. khob…ino bayad bedooni ke hame irooniha alan behet eftekahr mikonan va minazan…khodet midooni chi migam…mosahebe telefonit ba tv4 iran ro bayad bedooni hade agal 40 melyoon zende shenidan..midooni yani chi..yani hame ina barat arezooye movafagiat daran..chon ye 2khtar irooni hasti to…. rasti…behemoon bayad ghol bedi bad az inke az faza omadi va karat roo anjam dadi dar avalin forsat ke toonesti ye bar iran biay..mardome iran hame montazeretan anousheh…pas ye bar iran bia va ba ye tv iran pakhsh zende dashte bash inbar ba tasvir khodet..bashe..bayad ghol bedi…nayat narahat mishim.. I wish you a safe and interesting journey.when you see your dreams in space worship the great GOD and pray for young people all over the world especially in IRAN to achieve their scientific dreams and those which are related to space. My friend Kimber and I are watching your experience with great excitement. We are both waiting to fly suborbital with SA and met a member of your family (brother?) at Dennis Tito’s home in May. Congratulations on being named to the primary crew. We hope the experience is everything you’ve dreamed and we want to follow in your footsteps soon! when I heard that the first Iranian who want to travel in space is a woman I became so happy in my heart.You will make your dream true.and Ilearn it from you that If we want, our dreams become true and my dream is like you .And when I growup I want to be an astronut. jaye maro ham khali konid!! خانم انصاري وقتي مصاحبتون رو با شبکه 4 ايران ديدم واقعا گريه ام گرفت. از صميم قلب براتون آرزوي موفقيت مي کنم. با آرزوي پيشرفتهاي بعدي براي شما. I am from norht of iran , be side of caspian sea. man az shomale iran , az kenare daryaye khazar , barat minevisam. dar safaret movafagh bashi , arezooye salamati barat mikonam. mosahebe shoma ro az TV4 iran didam va besiar lezat bordam. be omide solh ruye in koreye khaki va koochak! I have listened to your interview with Iranian Channel 4 TV, you cant imagine how proud Iranian are to have a talented, genus daughter like you, what adds to this is to see how humble and cool you are. Many people are millionaires these days, it is easy to go to expensive holidays and so forth but how many people could go to space and still remain as humble as you are. Imagine one day you join with Bill Gates on an especial project, wow I cant wait to hear the news of that project. Anyway, Bon Voyage and when you reach to the space station, just close your eyes for a second and remember howmany Iranian are thinking about you, whilst they have their own dreams and destinies and the hope you created for them. hello dear Anousheh. i am very happy because i see an iranian woman will go to the space. so i found your blog and i started writing you this comment. i am going to ask you to do a favor on all of the iranians and your countrimates. i think its better to write a blog in persian and upload your movies and pics on it ( because as you know just a few group of people in iran know english ). i am as interested as you are but i can not contact you because i live in a small city in iran and there are so limitation here. i will be happier if you write me my answer and the address of your persian blog. with the best wishes for you. khoshhalam ke avalin khanoume fazagarde donia ba man hamzaboune va man mitounam behseh begam ke ba tamame vojoudam baratoun arezuye safari khosh daram va omidvaram ke salemo salamat be khounatoun bargardin. we (iranian) are so proud about you not just because of your flight but because you are a model of successful woman in diffrent field. we hope a wonderful flight for you . سلام انوشه عزیز من هم برای سفرت لحظه شماری میکنم وخدا میداند چقدر هیجان زده هستم چون نه تنها تو به رویاهای کودکی خودت رسیده ای بلک رویاهای نسل ما را که مانند تو چنین آرزوهایی داشته ایم برآورده کرده ای راستی من دبیر فیزیک در رشت هستم و تمام دانش آموزانم دوستت دارند در تابستان کلاس تابستانی داشتم و با گفتن داستان تو به آنها انگیزه و امید میدادم تمام دانش آموزانم دوستت دارند و یه تو درود میفرستند. دیشب هرفهایت را شنیدم ممنون انوشه عزیز ممنون که از طرف تک تک ایرانیها افتخار را به فضا میبری . and I am so glad that I was born in Iran and that I am one of the Iranian people since you are and some of the other famous researchers all over the world are Iranian. anoosheh aziz bedan dar tamame safarat ghalbeh melyoonha irany ba tost doostat darim. We prayer for you to be happy and successful. shayad badaz moddatha be irani boodanam eftekhar kardam vagty shoma ro didam. oonja ke hastin be yade man ham bashin. ba ye sabad arezo0haye gashang . Hi from Chile, South America!!!! I am so happy to have the chance to go at ISS… wow!!!! I am a TTIian. I came to know about your voyage from one of my current colleagues who remembered you from one of our conversations. I am really happy that you are getting a chance to fulfill your dream. You are an inspiration to everyone. Best wishes on behalf of all TTIians who did not get a chance to wish you. You made us all proud. Have a great voyage. Wish you a safe return home. I’m really proud of you as an Iranian. You are going to a place where you can see God; try to use the best of these moments and pray for yourself, family and your country, Iran. Wish you the best. A question: how can I contact you using a ham radio. I currently live in London. I really appreciate if you could answer this this for me. I did see the program from Iran, channel 4, where you spoke about ham radio and that you will speak to Iranian people. How is it possible to speak with you from London. از اینکه اولین هستی خیلی خوشحالم اولین زن. اولین ایرانی امیدوارم بهترین لحظات رو به یاد ما هم باشی. I’m very happy that you are the first one, the first Iranian, the first woman. I wish you remember us in your best moments. This beautiful trip will end, but please don’t forget Iran, Iranian women, science in Iran and all orphans in Iran. Thank you for imagining, inspiring and being the change. I don’t know what to say but we love you and good luck in space. afarin.afarin,afarin,…afarin be iran ke khakesh che adam haei ro parvaresh mide,afarin be iran ke zananesh mesle mardhash ba gheirat hastan,khoda ro shokr mikonam ke irani hastam,tu iran be donya umadam,tu iran bozorg shodam va tu hamin khake moghaddas ham mimiram.omid varam be salamat berid va bargardid. fekr konam hich kas ta hala tu faza baraye man doaa nakarde,chera baraye man!,baraye hame mardome jahan va be khosus ma iraniha va mosalmuna, azatun hamin 1 kar ro mikham ,ke ma ro un bala doaa konid,az samime ghalb baratun arezuie movafaghiiat mikonam. afarin, afarin, afarin,…afarin bar shoma ,afarin bar iran ba in khake moghaddasesh,afarin bar iran ke na tanha mardhash, balke zanhash ham ba gheirat va shoja hastan,taze mafhume in sokhane payambaremun mohammad ro mifahmam ke :”az damane zan hast ke mard be me’raj raft”. khoda ro shokr mikonam ke irani hastam, khoda ro shokr mikonam ke tu iran be donya umadam va enshallah dar hamin khake moghaddas ham az donya miram. mitunam 1 khaheshi az shoma bokonam? omid varam be salamt berid va bargardid. baese eftekhare hameye khanoomeye doniast ke avalin jahangarde donia 1 khanoome.amaa man be onvane 1 dokhtare irani nemitoonam be shoma eftekhar konam,chon shoma az ma sharm darin.nemoonash sitetoone(anoushehansari.com)ke hich ja nadidam neveshte bashe “Anousheh Ansari was born in iran” ya 1 chizi ke maloom beshe in khanoome mohtaram aslo nasabesh be iran barmigarde.age eshtebah mikonam,mano motavajeye eshtebaham bokonid.be har hal az tahe ghalbam baratoon arezoo mikonam ke ba movafaghiat va salamat bargardin va derekhtetoono ba daste khodetoon bekarin. You are such an inspiration! I am so thrilled for you and your passion to follow your dreams, and I wish you the best time in your life as you go out in to space. Can’t wait to here all about it! Moaleman man dar iran naghsheh mohemi dar alagheyeh man beh reshteyehayeh elmi dashtand. Fizik yeki az behtarin kelashayi bood keh man dashtam. Moalemaneh irani, beh nazareh man, az behtarin and ba houshtarin moalaeman donya hastand. Hatman barayeh man addreses khdetan ra befrestid va begouyid chand shagerd darid. Man barayetan aks va patch khodam ra khaham ferestad. I’m proud to see the first female space tourist to be a fellow Iranian. I was also part of the space program myself. I worked at NASA Johnson Space Center in the Extravehicular Activity (EVA) group as an instructor and flight controller and trained many of the Shuttle and ISS astrounauts and cosmonauts. I’m proud as an Iranian American myself to have you represent our home land. هستي هستم از رشت.حق با شماست.من متوجه ي اون قطعه نشده بودم و پرچم ايران رو نديدم و اصلا” نميدونستم سايت فارسي زبون داريد.ممنون که من رو متوجه ي اشتباهم کردين و ازتون معذرت ميخوام.باز هم براتون ارزوي موفقيت ميکنم و مطمئنم که سلامت پيش خانوادتون بر ميگردين چون دعاي 1 ملت پشتتونه.هممون دوستتون داريم و اميدوارم اشتباه منو ببخشيد.